In this guide I have tasked myself with the impossible; to decide which LEGO BIONICLE sets are the best ever. I decided to choose only the original BIONICLE sets because that’s what I grew up with and because Gen 2, in my opinion, do not live up to the original. 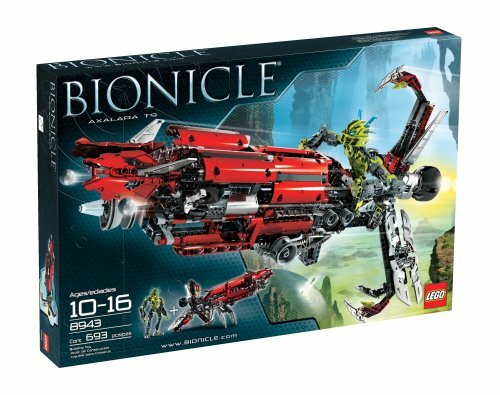 Please note that the best 10 sets below are based on my opinion as a life-long BIONICLE fan. If you disagree please share your top 10 in the comments. Several choices consist of more than one set. That is because these sets were just clones of each other with different color schemes and equipment. As if the Bohrok were terrible enough, it was eventually revealed that they have two queens. They are the Bahrag, Cahdok, and Gahdok. Whereas the Bohrok is small and sleek in appearance, the Bahrag have more TECHNIC to show than most BIONICLE sets. As the Bahrag, they have all the powers of the Bohrok. They are two of the worst enemies the Toa have ever faced. Like their Bohrok minions, the Bahrag feature a lever that lets their heads snap forward to bite. The difference is, the Bahrag have teeth! They are like giant snapping bug-monsters. Like many LEGO BIONICLE sets, they also have an alternate model, known as the Bahrag Spider. Two characters for the price of one. Has the same eyes as the Bohrok. Doesn’t have much else to do aside from lunging forward to bite. This would be the crown jewel of any Bohrok collection in the BIONICLE line, and they are big enough to take on the Toa at once. Plus, that jaw of theirs looks terrifying. This person is not a Toa, but a mask that created a body for itself. There is a bit of a story behind this character, so let’s explain. 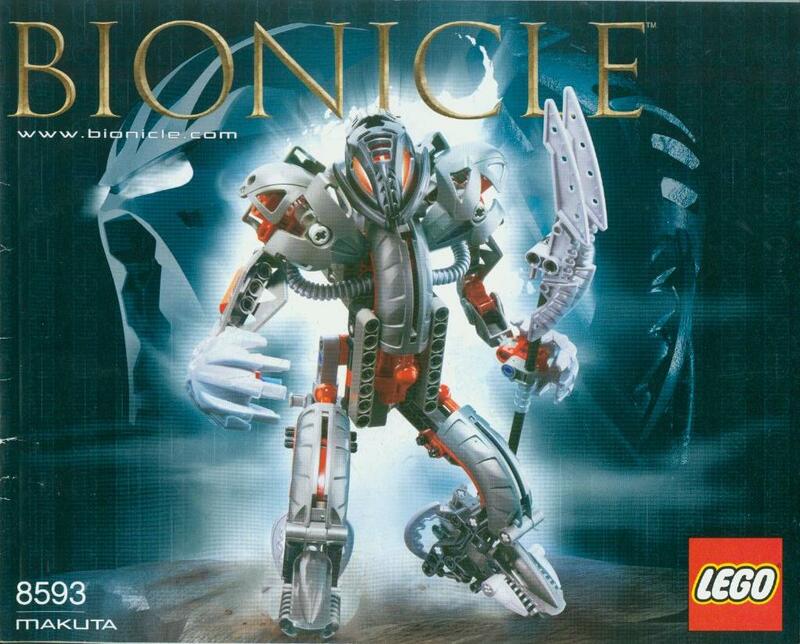 Eons ago, the Great Beings that put Mata Nui in charge of the BIONICLE universe created the most powerful mask in existence: Ignika, the Mask of Life. It was a failsafe in case Mata Nui were ever to get hurt or die; the mask has the power to create life itself. It’s also sentient and has a will of its own. In 2006 and 2007, the Mask was the focus of a quest to save the life of Mata Nui, who, thanks to Makuta, was at death’s door. Afterward, inspired by the heroism of the Toa and aware of the danger of Makuta, the Mask created a body for itself to join the fight to save the universe. 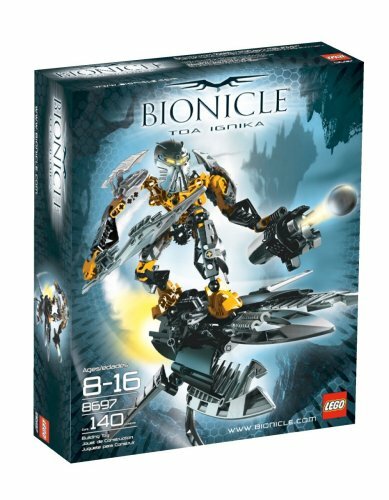 The Toa Ignika set itself was released in 2008 as part of the Phantoka sets from the first half of that year’s storyline. The Toa Ignika comes with the second version of the Mask of Life available. He’s also got some unique features that help him stand out from the other Phantoka sets. He contains blades on his shoulders and a 5″ long sword known as the Sword of Life. With it, he can channel his powers at will. The weapon in his other hand is the Midak Skyblaster, a type of cannon that fires spheres of light. He also has a skyboard that he can use to travel through the sky at incredible speeds. It also serves as a way of posing him. The second version of the Mask of Life. Comes with a long sword and Midak Skyblaster. Comes with skyboard that Toa Ignika can attach and detach from. 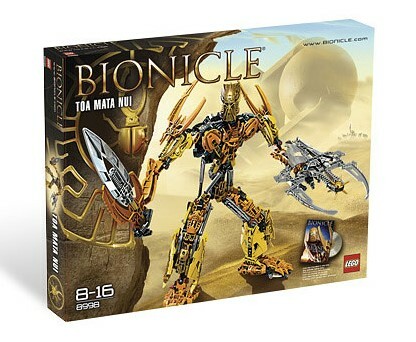 Same essential pieces as the Phantoka versions of the Toa Mata/Nuva. Aside from the cool sword and the skyboard, the main draw to this set is the fact that it has the Mask of Life in it. The Mask of Life had been in retail sets before, but last time, it was fused to the skull of another character (long story). This was the first time it was ever on its own, so I feel it deserves a feature as one of the best original LEGO Bionicle sets. Spoiler alert on this one. After a series of events, Mata Nui was awakened but ended up exiled from his universe inside the Mask of Life. He wound up in another universe where the Mask made him a new body. He discovered that he could use the Mask of Life to change things that are, or were, alive, making them more powerful. Armed with new weapons and new friends, Mata Nui set forth to find a way home and save his universe. Toa Mata Nui has some fantastic features. A new, special edition version of the Mask of Life was included, along with a sword created by the Mask of Life. The shield he wears is a Scarabax beetle that Mata Nui befriended and named Click. Thanks to the Mask, Click can turn into a shield when needed in battle. Mata Nui has also got a Thornax launcher that launches spiky little balls at enemies. For movement, Mata Nui is incredible. Instead of standard TECHNIC pieces as hands, Mata Nui’s are posable. That’s only happened a few times in the franchise’s history. Thanks to the pistons on his legs and chest, they can get both pivots in different directions. Comes with cool sword, shield, and Thornax launcher. Chest, legs, and feet can pivot. 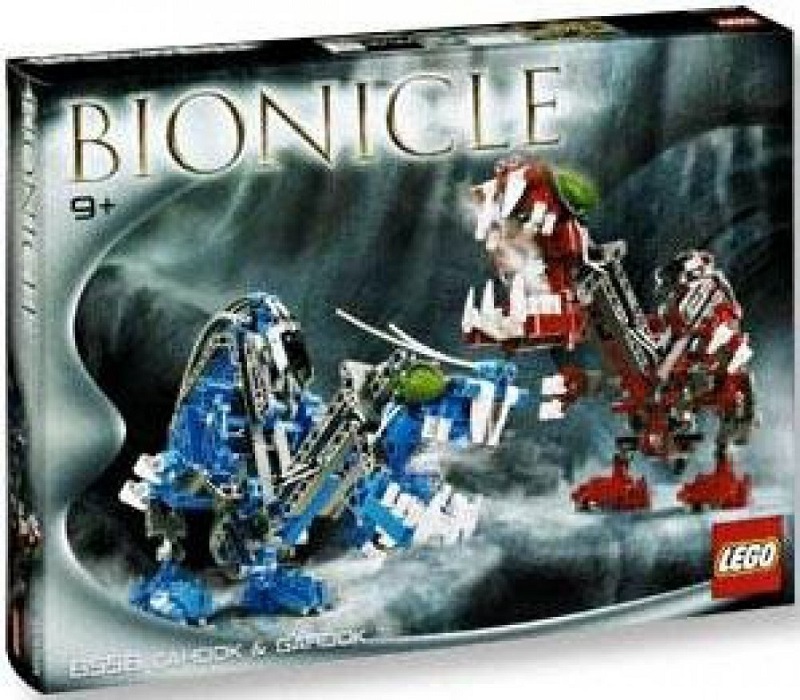 Life counter for BIONICLE battle game. Just a bigger version of the smaller Mata Nui set. Lots of gaps in the pieces. The shield doesn’t look like Click does. This is an impressive original BIONICLE build, and one of the only builds that was a remake of an already created character. It offers a lot of posability, which is its main draw. You can either get this, or the smaller Mata Nui set. Aside from the Matoran and other sentient beings, the BIONICLE universe was home to the Rahi, the Matoran term for animals. There were plenty of Rahi over the years, but the first was introduced back in 2001. Having used his dark powers to corrupt the island’s Rahi, Makuta set them against the Toa and the Matoran they protected. One of the best of them was the Tarakava. The Tarakava are lizards that live and hunt for prey in shallow waters. They have strong arms that deliver lightning-quick punches. They are dangerous, and Makuta has made them even worse. 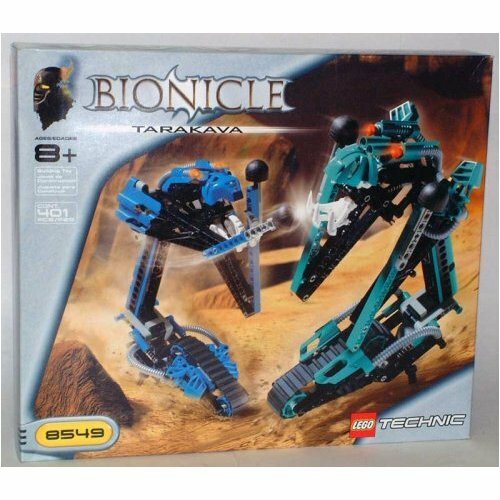 The Tarakava set is a two for one deal; two sets in one box. The treads on the bottom let them move around fast. The thin torso can be held in one’s hand for a good grip. The best part, though, is the levers on their arms: flip them to make them punch! Rock’em sock’em Rahi! Treads make for easy movement. Can be held in one hand. Levers allow for punching action. Shoulders forcibly connected to center in a manner that will harm the bricks. The Tarakava are one of the more memorable Rahi sets in BIONICLE, and it’s easy to see why. Between the treads for fast movement and the boxing glove arms, a fan could play with these as a LEGO boxing match. Say hello to the big bad of BIONICLE himself, Makuta. That’s misleading. Makuta had abandoned the need for a physical form eons ago. This is what he looks like when he wants to kill his enemies. He is the one responsible for Mata Nui’s slumber so that he may rule the universe himself. Wielding the Mask of Shadows, he is a sociopathic monster who likes hurting people for the fun of it. In other words, pure evil. Despite the number of pieces he has, Makuta is a complex build of BIONICLE and TECHNIC pieces. His legs are unique, their design like the hoof feet of the Devil. They don’t offer as much movement, but still look cool. He also has a gear on his back that lets him turn side to side. He’s armed with the Staff of Darkness. The big draw, though, is the way his mask is worn. Unlike previous characters, his head hangs on its side, letting the eyes stick out from the back. It’s scary to look at. Can turn side to side. It would be inexcusable to not include the main villain of the franchise as one of the best LEGO Bionicle sets. While Makuta can and would take other forms in the future, the first one is the most memorable from how menacing it is. He is the ultimate evil, and looks the part! Toa usually operates in teams of six as a rule. This is not always the case, however. As seen in the movie BIONICLE: Mask of Light, a mask of incredible power, the only one of its kind, was found. That mask would be worn by a seventh Toa, a Toa of Light destined to pierce the darkness of Makuta. That Toa is Takanuva. Takanuva has the same build and parts as the Toa and their improved forms, the Toa Nuva. The main difference is that he is golden and white, symbolizing him as the Toa of Light. He comes with the Ussanui, a vehicle made from the same parts as enemies the Toa defeated in the past. He uses the Ussanui as his mount to ride into battle at the climax of his movie, Mask of Light. New character featuring golden armor and mask. 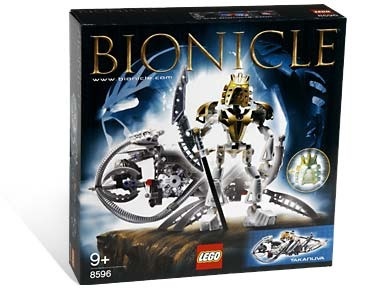 Unique vehicle, one of the first in BIONICLE history. The main character of BIONICLE: Mask of Light. Takanuva has the same pieces as the other Toa up to that point. Even if he does have equal parts as the other Toa, Takanuva is unique for his story. He was the main focus of the first BIONICLE movie and would play a significant role in the series going forward. He was also my favorite character in the franchise. Wake one, and you wake them all. The main antagonists of the 2002 line of BIONICLE, the Bohrok are a race of mysterious, insectoid beings. They exist for only one purpose: to destroy everything on Mata Nui. 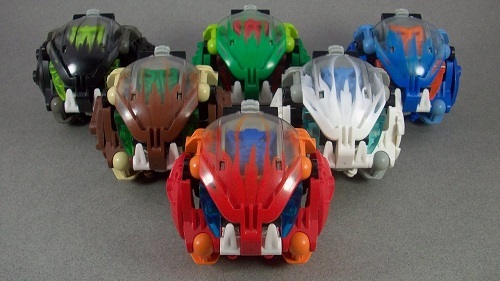 There are six swarms of Bohrok, each one having control over six elements. Aside from the Levhak, who wield acid, every Bohrok wields one of the elements the Toa use. Unlike the Toa, the Bohrok do not use masks. Instead, they use these brain-like organisms called Krana. They eject it from their heads to attack, ensnaring the victims to the Bohrok swarm. Smaller than the Toa, the Bohrok are compact and full of fun. The big draw to them is their ability to morph from ball form to attack mode. Pushing the lever on their backs will cause the head to snap forward. Flick the eyes down, and their heads will open to eject the krana against their enemies. Ingenius lever allows the head to snap forward. Compact size makes them easy to carry around. Can be stored hanging from the lid of their containers, to make it look like they’re asleep. The krana they use can be placed on the faces of the Toa. Can combine into Bohrok Kaita’s. All other Krana sold separately. These insect monsters are small in size and pieces, but they continue BIONICLE’s trend to freedom of movement. They were kind enough to warrant a follow up in 2003 with the more powerful Bohrok-Kal. A LEGO collector will love these things. In the final battle between the armies of Makuta and the Toa, Lewa gains a powerful new weapon in the Axalara T9 battlecruiser. Its armed with dual Midak Skyblasters, shields, and lasers, this thing is as deadly as they come. Thanks to a new set of armor, Lewa is ready to ride into battle. Aside from a special edition Lewa, the Axalara T9 has plenty of special features. The gears on the side can open and close the tri-arms, the landing gear can be raised and lowered, and the sides can open to reveal the Midak Skyblasters. Best of all, the handle underneath can be used to fly this BIONICLE set into battle! Landing gear raises and lowers. Tri-arms with gears to open and close. The handle can be used to fly. Never released in New Zealand. This is like they took the Ussanui from years ago, and improved upon it with new weapons and features. It’s awesome and deserves a feature as one of the best LEGO BIONICLE sets. They waged their battles against the darkness, protecting the city and the Matoran from harm. Facing eldritch vines, mindless robots, assassins, and other monsters, they fought and won. 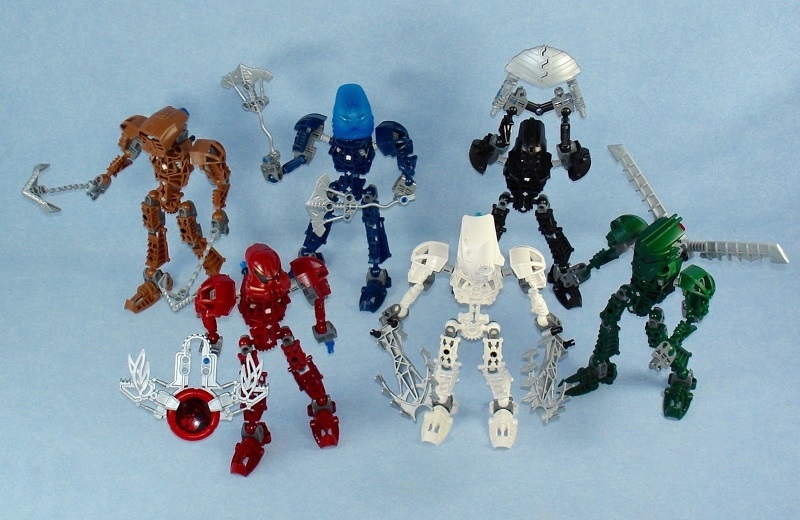 These were some of the best Toa sets to ever come out of BIONICLE. Improving upon the original Toa, the Toa Metru had more joints of articulation in the legs and arms. The armor got streamlined for a sleeker appearance, and the gears were on the inside. Even the masks were more elegant in appearance. The arms can still move thanks to the gears. Each comes with disks with Toa’s name and face on them. Up to 8 ball-socket joints for articulation. Can combine into a new character: Krahka, a shapeshifting Rahi. Does not combine into Toa Kaita’s. These are some of the best LEGO BIONICLE original sets ever, but they are more than that. Since they are Toa from a thousand years ago, their existence signaled the expansion of the franchise beyond the island of Mata Nui. Soon, an entire universe began to form, and they were what kick-started it. These are sets that you do not want to miss out on. 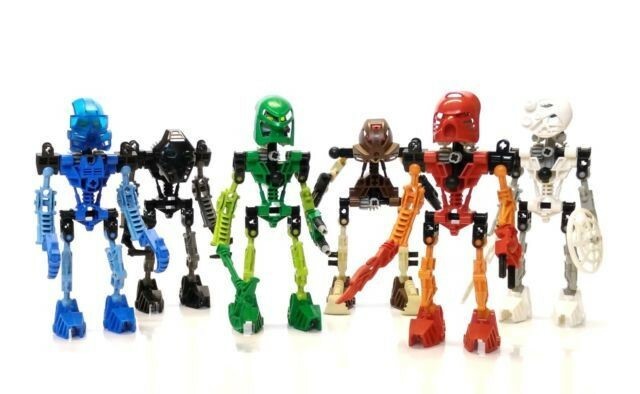 The Toa Mata, the first and foremost team of heroes from BIONICLE. They arrive on the island with the purpose of freeing it from Makuta and awakening Mata Nui. Each one of them represents a different element that they hold complete mastery over. They are also color-coded by element so that people can tell them apart. Tahu, Toa of Fire = Red. Kopaka, Toa of Ice = White. Gali, Toa of Water = Blue. Lewa, Toa of Air = Green. Onua, Toa of Earth = Black. Pohatu, Toa of Stone = Brown. This color scheme remains the same for most Toa, so remember it. Aside from their unique tools and weapons, each Toa comes with a different mask. They’re not for show. In-universe, the masks give the Toa different powers, from x-ray vision to super speed and more. One of the most critical pieces to each set is something people might not even realize: their canisters. In-universe, the canisters are how the Toa arrived on Mata Nui, and serve as a storage unit when not in use. The level of articulation found in the Toa is incredible. The ball-socket joints for the limbs allow them to move and rotate like they would in real life. The gears inside the chest can turn to let the arms move 360-degrees. The coolest thing, though, comes when all six unite. Since they have the same essential pieces, they can combine into two, more massive warriors, the Toa Kaita. Amazing masks that can get swapped out. The lid on canister functions as a way to store masks. Combine them into mega-warriors, the Toa Kaita. Joints and gears allow for full range of movement. Came with little CDs about the Toa. Extra masks for Toa sold separately. These guys are so much fun, not only to build but to play with. Since they are part of a larger universe, kids can re-enact all their adventures. There would be later versions of the Toa released, but the originals are some of the best. 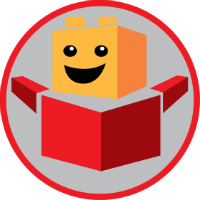 I hope that this guide has helped you in finding the best LEGO BIONICLE sets. If you disagree with this list or want to add to it, please comment below with your favourite sets from the BIONICLE universe. Find the 10 best Original LEGO BIONICLE sets, featuring the Toa Mata, Toa Metru, Axalara T9, Bohrok, Takanuva, Makuta, Tarakava, Toa Mata Nui and more!